They say that if you put a frog into boiling water, it will jump out. But if you put the same frog in cold water and gradually turn up the heat, it will never jump out until it’s too late, and get[s] cooked. That’s exactly how the Obama administration is removing our freedoms, one at a time. And he has been astonishing successful. America in 2015 is a place Jesus Christ and the Bible are considered hate speech, and the LGBT Agenda is glorified. A place where everyone has rights except the bible believing Christian, run by an administration that allows Iran to have nuclear weapons but posting a Bible verse to your personal computer is illegal. America, the wolf is in the White House and you are losing the battle for your liberty. It’s time to wake up, or admit defeat. 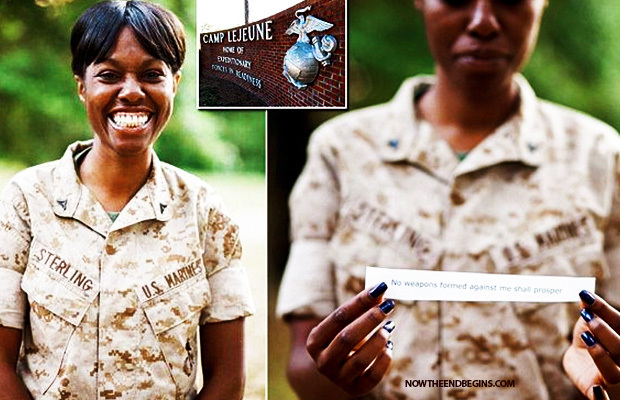 Sterling, who represented herself at trial, was convicted February 1, 2014 in a court-martial at Camp Lejune, North Carolina after she refused to obey orders from a staff sergeant to remove the Bible verses from her desk. She was found guilty of failing to go to her appointed place of duty, disrespect toward a superior commissioned officer, and four specifications of disobeying the lawful order of a noncommissioned officer. Both lower court and the appellate court ruled that the Religious Freedom Restoration Act did not apply to her case because displaying a Bible verse does not constitute religious exercise. However, a religious liberty law firm and a high-powered, former U.S. solicitor general have taken up her case and have filed an appeal to the U.S. Court of Appeals for the Armed Forces. Sterling wised up and finally got legal counsel. Now representing her are the Liberty Institute along with former U.S. Solicitor General Paul Clement, also a law professor at Georgetown University. Clement most recently won a Supreme Court victory on behalf of Hobby Lobby against the Affordable Care Act. Liberty Institute and Clement plan to argue that the appellate court should have applied the Religious Freedom Restoration Act in Sterling’s case – protecting her right to post Bible verses as a form of religious exercise. According to the appellate court’s decision, they were not convinced “that displaying religious text at a shared government workstation would be protected even in a civilian federal workplace.” They also considered the fact that Sterling’s desk was shared by other Marines. Attorney Berry points out that other Marines were allowed to decorate their desks. However, the lower courts refused to allow that evidence to be admitted. And at the time of the incident – Sterling was not sharing a desk. Berry said the supervisor cursed at Sterling and ordered her to immediately remove the verses. She refused the order. The following day, she discovered the verses had been removed and thrown in the trash. “Adding insult to injury, the government charged her with the crime of failing to obey a direct order because she did not remove the Bible verse,” Berry said. As it now stands – Sterling is unemployed and looking for work. It’s a process made harder because of the bad conduct discharge from the military.